The IP Code (International Protection, also known as Ingress Protection) classifies and rates—for mechanical and electrical enclosures—the degree of protection provided against intrusion from solid objects (e.g, body parts, hardware, wires, dust, dirt, etc.) and freshwater. The equivalent European standard is EN 60529, which is specified by the International Electrotechnical Commission (IEC). Refer to the latest revision of the required standard when conducting tests for agency certification. The National Electrical Manufacturers Association defines NEMA enclosure types in NEMA standard number 250. Ratings between the two standards are not directly equivalent: NEMA ratings also require additional product features and tests (such as functionality under icing conditions, enclosures for hazardous areas, knock-outs for cable connections, etc.) not addressed by IP ratings. The second digit indicates the level of protection that the enclosure provides against harmful ingress of freshwater. b) A spray nozzle with a counterbalanced shield. Test a is conducted for 5 minutes, then repeated with the specimen rotated horizontally by 90° for the second 5-minute test. Test b is conducted (with shield in place) for 5 minutes minimum. b) A spray nozzle with no shield. Test a is conducted for 10 minutes. Test b is conducted (without shield) for 5 minutes minimum. 1) The ratings for water ingress are not cumulative beyond IPX6. A device which is compliant with IPX7, covering immersion in water, need not be compliant with IPX5 or IPX6, covering exposure to water jets. A device which meets both tests is indicated by listing both tests separated by a slash, e.g., IPX5/IPX7. 2) All tests with the letter "K" are defined by ISO 20653 (replacing DIN 40050-9) and are not found in IEC 60529, except for IPx9 which is the same as the IP69K water test. IP20 Protected from touch by fingers and objects greater in size than 12 millimeters. Not protected from liquids. IP21 Protected from touch by fingers and objects greater in size than 12 millimeters. Protected from condensation. IP22 Protected from touch by fingers and objects greater in size than 12 millimeters. Protected from water spray less than 15 degrees from vertical. IP23 Protected from touch by fingers and objects greater in size than 12 millimeters. Protected from water spray less than 60 degrees from vertical. IP24 Protected from touch by fingers and objects greater in size than 12 millimeters. Protected from water spray from any direction. IP25 Protected from touch by fingers and objects greater in size than 12 millimeters. Protected from low pressure water jets from any direction. IP26 Protected from touch by fingers and objects greater in size than 12 millimeters. Protected from high pressure water jets from any direction. IP27 Protected from touch by fingers and objects greater in size than 12 millimeters. Protected from immersion between 15 centimeters and 1 meter in depth. IP28 Protected from touch by fingers and objects greater in size than 12 millimeters. Protected from long term immersion up to a specified pressure. IP30 Protected from tools and wires greater in size than 2.5 millimeters. Not protected from liquids. IP31 Protected from tools and wires greater in size than 2.5 millimeters. Protected from condensation. IP32 Protected from tools and wires greater in size than 2.5 millimeters. Protected from water spray less than 15 degrees from vertical. IP33 Protected from tools and wires greater in size than 2.5 millimeters. Protected from water spray less than 60 degrees from vertical. IP34 Protected from tools and wires greater in size than 2.5 millimeters. Protected from water spray from any direction. IP35 Protected from tools and wires greater in size than 2.5 millimeters. Protected from low pressure water jets from any direction. IP36 Protected from tools and wires greater in size than 2.5 millimeters. Protected from high pressure water jets from any direction. IP37 Protected from tools and wires greater in size than 2.5 millimeters. Protected from immersion between 15 centimeters and 1 meter in depth. IP38 Protected from tools and wires greater in size than 2.5 millimeters. Protected from long term immersion up to a specified pressure. IP40 Protected from tools and small wires greater in size than 1 millimeter. Not protected from liquids. IP41 Protected from tools and small wires greater in size than 1 millimeter. Protected from condensation. IP42 Protected from tools and small wires greater in size than 1 millimeter. Protected from water spray less than 15 degrees from vertical. IP43 Protected from tools and small wires greater in size than 1 millimeter. Protected from water spray less than 60 degrees from vertical. IP44 Protected from tools and small wires greater in size than 1 millimeter. Protected from water spray from any direction. IP45 Protected from tools and small wires greater in size than 1 millimeter. Protected from low pressure water jets from any direction. IP46 Protected from tools and small wires greater in size than 1 millimeter. Protected from high pressure water jets from any direction. IP47 Protected from tools and small wires greater in size than 1 millimeter. Protected from immersion between 15 centimeters and 1 meter in depth. IP48 Protected from tools and small wires greater in size than 1 millimeter. Protected from long term immersion up to a specified pressure. 4, 4X Watertight. Must exclude at least 65 GPM of water from a 1 in nozzle delivered from a distance not less than 10 ft for 5 min. Used outdoors on ship docks, in dairies, in wastewater treatment plants and breweries. X (as 4X) indicates additional corrosion resistance. 6, 6P Submersible. Design depends on specified conditions of pressure and time; submersible in water or oil; used in quarries, mines, and manholes. 6 is temporarily submersible, 6P withstands occasional prolonged submersion. Neither are intended for continuous submersion. 12, 12K General-purpose. Intended for indoor use, provides some protection against dust, falling dirt, and dripping non-corrosive liquids. Meets drip, dust, and rust resistance tests. The following table outlines which IEC 60529 IP code each respective NEMA rating meets. Read the complete definintions of NEMA Enclosure Types. 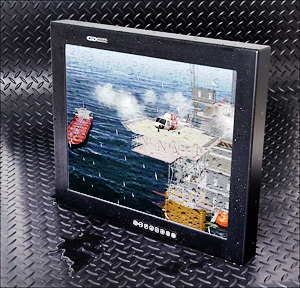 We build many configurations of IP67-rated industrial- and military-grade LCD monitors that are sure to meet your needs. Take a look at our Barracuda line now. The information contained in this Web site is for general information purposes only. The information is provided by General Digital Corporation and while we endeavour to keep the information up to date and correct, we make no representations or warranties of any kind, express or implied, about the completeness, accuracy, reliability, suitability or availability with respect to the website or the information, products, services, or related graphics contained on the Web site for any purpose. Any reliance you place on such information is therefore strictly at your own risk.